1 Department of Anesthesiology, School of Medicine, Keio University, Tokyo, Japan. 2 Department of Anesthesiology, Kitasato Institute Hospital, The Kitasato Institute, Tokyo, Japan. 3 Department of Physiology, School of Medicine, Teikyo University, Tokyo, Japan. Nicotine exposure is a risk factor in several breathing disorders Nicotinic acetylcholine receptors (nAChRs) exist in the ventrolateral medulla, an important site for respiratory control. We examined the effects of nicotinic acetylcholine neurotransmission on central respiratory control by addition of a nAChR agonist or one of various antagonists into superfusion medium in the isolated brainstem-spinal cord from neonatal rats. Ventral C4 neuronal activity was monitored as central respiratory output, and activities of respiratory neurons in the ventrolateral medulla were recorded in whole-cell configuration. RJR-2403 (0.1-10mM), a4b2 nAChR agonist induced dose-dependent increases in respiratory frequency. Non-selective nAChR antagonist mecamylamine (0.1-100mM), a4b2 antagonist dihydro-b-erythroidine (0.1-100mM), a7 antagonist methyllycaconitine (0.1-100mM), and a-bungarotoxin (0.01-10mM) all induced dose-dependent reductions in C4 respiratory rate. We next examined effects of 20mM dihydro-b-erythroidine and 20mM methyllycaconitine on respiratory neurons. Dihydro-b-erythroidine induces hyperpolarization and decreases intraburst firing frequency of inspiratory and preinspiratory neurons. In contrast, methyllycaconitine has no effect on the membrane potential of inspiratory neurons, but does decrease their intraburst firing frequency while inducing hyperpolarization and decreasing intraburst firing frequency in preinspiratory neurons. These findings indicate that a4b2 nAChR is involved in both inspiratory and preinspiratory neurons, whereas a7 nAChR functions only in preinspiratory neurons to modulate C4 respiratory rate. Key terms: brainstem-spinal cord, neonatal rat, inspiratory neuron, preinspiratory neuron, nicotinic acetylcholine receptor. In central respiratory control, chemosensitive neurons in the rostral ventrolateral medulla (RVLM) are thought to provide tonic drive to the neuronal network (Eugenin and Nicholls, 1997; Richerson, 1998; Eugenin et al., 2001), which mainly comprises inspiratory (Insp) neurons and preinspiratory (Pre-I) neurons involved in the generation of respiratory rhythm (Onimaru and Homma, 1987, 2003; Onimaru et al., 1988, 1989, 1997). Acetylcholine (ACh) is an excitatory neurotransmitter that functions in central respiratory control (Murakoshi et al., 1985; Monteau et al., 1990; Burton et al., 1995; Shao and Feldman, 2000, 2001, 2002, 2005), including central chemosensitivity (Monteau et al., 1990; Burton et al., 1997; Eugenin and Nicholls, 1997; Eugenin et al., 2001; Okada et al., 2001; Sakuraba et al., 2005). Both muscarinic and nicotinic ACh receptors have been shown to participate in the cholinergic mechanisms that help regulate respiratory rhythm. Maternal cigarette smoking is indicated as a major dose-dependent risk factor in sudden infant death syndrome (Blair et al., 1996). Prenatal nicotine exposure also has been linked to a high incidence of apnea and altered breathing pattern in neonatal rodent (Robinson et al., 2002; Huang et al., 2004), although the contribution of nicotinic ACh receptors (nAChRs) to central respiratory activity remains imperfectly understood. In the RVLM, which includes central respiratory control, nAChRs comprising a4b2 and a7 are expressed (Wada et al., 1989; Dominguez del Toro et al., 1994). In medullary slice preparations from neonatal rats that generate respiratory rhythm (Smith et al., 1991), nicotine induces increases in respiratory frequency and activations of inspiratory neuron (Shao and Feldman, 2001). These increases are antagonized by a4b2 nicotinic antagonist dihydro-b-erythroidine (DH-b-E), while a7 antagonist a-bungarotoxin (a-BgTx) and methyllycaconitine (MLA) have no effects on nicotine-induced respiratory activation (Shao and Feldman, 2002). These findings suggest that the predominant subtype of nAChR involved in central respiratory control is the a4b2 combination, not the homomeric a7 subunit. However, these studies were conducted in medullary slice preparations, in which the Pre-I neuron network is absent. This may be significant as Pre-I neurons have been shown to act as a source of respiratory rhythm generation and to trigger periodic activity in inspiratory neuron network in brainstem-spinal cord preparations of neonatal rats (Onimaru et al., 1988, 1989, 1997; Onimaru and Homma, 2003). Recent studies have indicated that both Pre-I neurons and Insp neurons are essential for respiratory rhythmogensis in brainstem-spinal cord preparations (Takeda et al., 2001; Mellen et al., 2003; Sakuraba et al., 2003). In a previous study, we found that neuromuscular blocking agents (NMBAs), which function as muscular nAChR antagonists, exert their inhibitory effects on Pre-I neurons (Sakuraba et al., 2003). This finding led us to hypothesize that some subtypes of nAChRs might participate in the modulation of respiratory activities, such as rhythm generation, in the central respiratory network, comprising both Pre-I and Insp neurons. However, in brainstem-spinal cord preparations of neonatal rats in which the complete central respiratory network remains intact, it has been reported that the application of individual nAChR antagonists, such as the ganglion blocker mecamylamine (Meca) or the NMBA gallamine, does not affect C4 respiratory rate (Monteau et al., 1990). In the present study, we reevaluate the effects of the sole application of nAChR antagonist and agonist on C4 respiratory rate in an attempt to clarify which subtypes of nAChRs participate in the central respiratory network comprising both Pre-I and Insp neurons. All procedures were conducted in accordance with the guidelines set forth by the scientific committee of Teikyo University. Data were obtained from 147 neonatal rats (0-4 days old, Wistar rats). The isolated brainstem-spinal cord has been described in detail elsewhere (+Kuwana et al., 1998; Sakuraba et al., 2003). In brief, the rats were deeply anesthetized with diethyl ether, and the brainstem and cervical spinal cord were isolated in a chamber filled with oxygenated artificial cerebrospinal fluid (ACSF). The cerebellum and pons were ablated. The preparation was transferred to a 2-ml recording chamber and fixed, ventral side up, to a silicon rubber base with miniature pins. The preparation was superfused at 26°C in control ACSF equilibrated with a control gas mixture (5 % CO2 in O2; pH = 7.4). The activity of C4 ventral roots was recorded using a glass suction electrode, amplified by a conventional AC amplifier (AVH 11, Nihon Kohden, Tokyo, Japan), and integrated (time constant 100 msec). Signals were recorded on a thermal array recorder and stored on digital tape for subsequent analysis. The control ACSF was replaced by various ACSF solutions, as determined by the protocols described below. The intracellular activity of Insp and Pre-I neurons in the superficial (< 400 mm) RVLM was recorded using a perforated patch clamp (Kuwana et al., 1998; Sakuraba et al., 2003). Neurons were identified and classified on the basis of their firing patterns and the temporal correlation of their activity to the respiratory cycle of the C4 ventral root activity (Onimaru et al., 1997; Sakuraba et al., 2003). Insp neurons discharge action potentials during the inspiratory phase (C4 burst activity phase). Pre-I neurons are characterized by preinspiratory and postinspiratory action potential discharges. A glass pipette (GC100-TF-10, Clark, Reading, UK) was pulled using a horizontal puller (PA-91, Narishige, Tokyo, Japan) to a tip size of approximately 2 mm. Electrode resistance ranged from 12 to 16 MW when the pipette was filled with a solution containing (in mM) 140 K-gluconate, 3 KCl, 10 EGTA, 10 HEPES, 1 CaCl2, 1 MgCl2, and nystatin (100 mg/ml). pH was maintained at 7.2-7.3 using KOH. The micropipette was inserted into the RVLM using a manual hydraulic micromanipulator. Membrane potentials were recorded using a single-electrode voltage clamp amplifier (CEZ 3100, Nihon Kohden, Tokyo, Japan). Neurons were located by applying positive pressure (10-20 cm H2O) inside the pipette. After a gigaohm seal was obtained, the recorded membrane potential gradually became negative and stabilized in about 10 min. The membrane potential (Em) was presented without correcting the liquid junction potential. The resulting perforated patch recording remained stable for more than 60 min. After the preparation was superfused with control ACSF for at least 30 min and the C4 activity reached a steady state, the control ACSF was replaced by several ACSF solutions containing nicotinic antagonist or agonist in accordance with the protocol. Mecamylamine hydrochloride (Meca, non-selective nAChR antagonist), dihydro-b-erythroidine hydrobromide (DH-b-E, a4b2 nAChR antagonist), methyllycaconitine citrate (MLA, a7 nAChR antagonist), a-bungarotoxin (a-BgTx, a7 nAChR antagonist) , and RJR-2403 hemigalactarate (RJR, a4b2 nAChR agonist) were purchased from Sigma-Aldrich corporation (St. Louis, Missouri, USA). Experiments were conducted under the protocols described below. We analyzed the effects of a nAChR agonist and several antagonists on C4 respiratory rate. After making a baseline recording, the control ACSF was replaced by ACSF containing Meca, DH-b-E, MLA (0.1, 1, 10, 100mM), a-BgTx (0.01, 0.1, 1.0mM) or RJR (0.1, 1.0, 10mM) for 10 min, followed by a washout period using the control ACSF for 10 min. We analyzed the effects of DH-b-E and MLA on Insp and Pre-I neurons in the RVLM. After the control recording, control ACSF was replaced to ACSF containing DH-b-E or MLA (20mM) for 10 min, followed by a 10 min washout period in which control ACSF was reintroduced. We examined intraburst firing frequency, drive potential amplitude, and drive potential duration to assess changes in the drive respiratory potential of Insp and Pre-I neurons. Intraburst firing frequency was calculated as the number of spikes per firing period. Drive potential amplitude was defined as the voltage difference between resting Em in the silent phase of the respiratory cycle and the peak plateau potential (without spikes) during depolarization. Drive potential duration was defined as the duration of the respiratory neuron depolarization cycle. And depolarizing cycle rate was defined as the number of depolarization per minute. All data before and during the application of drugs were analyzed using the paired-t test. P < 0.05 was considered significant. Data are expressed as mean ± S.E.M. Meca (0.1, 1, 10, 100mM), DH-b-E (0.1, 1, 10, 100mM) (Fig. 1A), MLA (0.1, 1, 10, 100mM) (Fig. 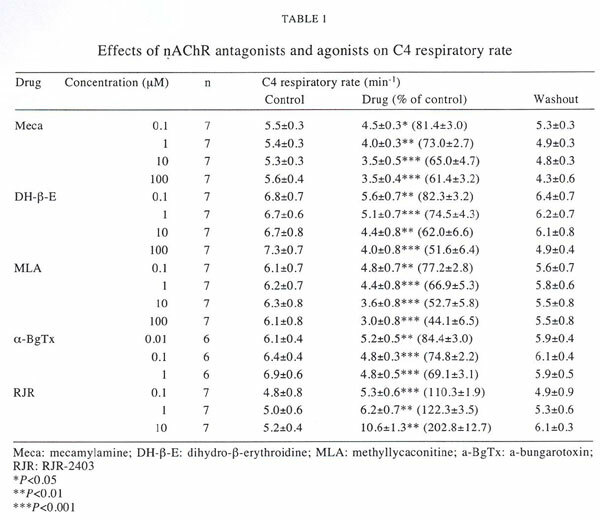 1B), and a-BgTx (0.01, 0.1, 1.0mM) all significantly reduced C4 respiratory rate (Table 1; n = 102). In contrast, RJR significantly increased C4 respiratory rate (Fig. 1C; Table 1; n = 21). These nAChR antagonists and agonists induced no changes in integrated C4 amplitude (data not shown). We analyzed the effects of DH-b-E and MLA on 24 respiratory neurons in RVLM. We classified these neurons into two groups _ Insp and Pre-I neurons _ based on their firing patterns during perfusion with control ACSF. The application of DH-b-E 20mM (n = 12) and MLA 20mM (n = 12) decreased C4 respiratory rate from 5.3 ± 0.6 to 3.4 ± 0.5 min-1 (P < 0.01) and from 4.8 ± 0.4 to 2.8 ± 0.2 min-1 (P < 0.01), respectively. DH-b-E and MLA decreased C4 respiratory rate and depolarizing cycle rate in Insp neurons (Fig. 2; Table 2). DH-b-E induced hyperpolarization of Em and decreased intraburst firing frequency, drive potential duration, and drive potential amplitude during DH-b-E-induced respiratory depression (Fig. 2A; Table 2). MLA significantly decreased intraburst firing frequency of Insp neurons, but did not induce any changes in Em, drive potential duration, or amplitude (Fig. 2B; Table 2). Figure 2: Effects of DH-b-E (A) and MLA (B) on the activity of inspiratory neurons. 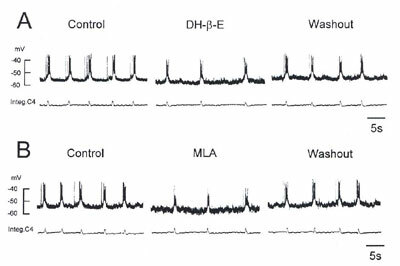 Top traces show the membrane potential of inspiratory neurons before (Control), during (DH-b-E 20mM or MLA 20mM), and after the application of DH-b-E and MLA. Bottom traces show integrated C4 (Integ.C4) activity (Washout). Both DH-b-E and MLA decreased C4 respiratory rate and depolarizing cycle rate and induced significant hyperpolarization of Em and reduction of intraburst firing frequency (Fig. 3; Table 3). The present study has shown that a4b2 nAChR antagonist DH-b-E and a7 nAChR antagonists MLA and a-BgTx decrease C4 respiratory rate in a dose-dependent fashion, while the a4b2 nAChR agonist RJR induces dose-dependent increases in C4 respiratory rate. These results indicate that both a4b2 and a7 nAChR subtypes participate in the regulation of respiratory activity in preparations of neonatal rat brainstem-spinal cord. In addition, we have shown that the a4b2 nAChR antagonist DH-b-E induces hyperpolarization of Em and decreases in intraburst firing frequency in both Insp and Pre-I neurons. The a7 nAChR antagonist MLA, however, has distinct effects on each of the major respiratory neuron populations: in Insp neurons, MLA does not affect Em polarity, but causes decreased intraburst firing frequency, while in pre-I neurons, it induces hyperpolarization of Em and decreased intraburst firing frequency. These results indicate that in brainstem-spinal cord preparation of neonatal rat, the a4b2 nAChR subunit participates in the regulation of Insp neuronal activity, while both the a4b2 and a7 nAChR subunits are present in Pre-I neurons and cooperate to modulate C4 respiratory rate. In the brainstem-spinal cord preparation used in this study, ACh produces increases in C4 respiratory rate that can be blocked partially by atropine, a muscarinic ACh receptor antagonist (Murakoshi et al., 1985). In this same preparation, the application of DH-b-E has no effect on ACh-induced increases in C4 respiratory rate, but the additional application of atropine completely blocks ACh-induced response (Murakoshi et al., 1985). Moreover, Meca has no effect on ACh-induced increases in C4 respiratory rate and the sole application of gallamine, a NMBA, also shows no effect on C4 respiratory rate (Monteau et al., 1990). Taken together, these previous studies have suggested that nAChRs are not involved directly in central respiratory control of brainstem-spinal cord preparation from neonatal rats, in which muscarinic ACh receptors play the dominant role, and that the contribution of cholinergic mechanisms to respiratory rhythm generation at rest is slight. However, our previous work has demonstrated that the sole application of NMBAs, which function as muscular nAChR antagonists, induces dose-dependent reductions in C4 respiratory rate (Sakuraba et al., 2003) and respiratory CO2 responsiveness (Sakuraba et al., 2005). It also has been shown that respiratory CO2 responsiveness is partly inhibited by the sole application of Meca and DH-b-E in the isolated brainstem-spinal cord preparation of neonatal rat (Kuwana et al., 2000). These findings strongly suggest that central respiratory control, including chemosensitivity, is directly mediated by nAChRs in the isolated brainstem-spinal cord preparation of neonatal rats. nAChRs are expressed in the RVLM, which has been identified as a locus of central respiratory control. These receptors are made up of two functional subunits, a4b2 and a7 (Wada et al., 1989; Dominguez del Toro et al., 1994). In a previous study, NMBAs were shown to inhibit neuronal a4b2 and a7 nAChRs expressed in Xenopus oocyte, which was interesting in that NMBAs are known to be antagonists of muscular nAChR (Chiodini et al., 2001). Given these and our previous results (Sakuraba et al., 2003, 2005), we hypothesized that both the a4b2 and a7 nAChRs are involved directly in central respiratory control. And, in fact, we found that the sole administration of Meca, DH-b-E, MLA, and a-BgTx decrease C4 respiratory rate and that RJR increases C4 respiratory rate in the isolated brainstem-spinal cord preparation of neonatal rats. In previous studies using medullary slice preparations from neonatal rats, nicotine-induced increases of respiratory frequency are completely blocked by Meca (Shao and Feldman, 2001), hexamethonium (Shao and Feldman, 2002), and DH-b-E (Shao and Feldman, 2002), but are not blocked by MLA or a-BgTx (Shao and Feldman, 2002). It also was reported that RJR increases respiratory frequency in a medullary slice preparation (Shao and Feldman, 2002). 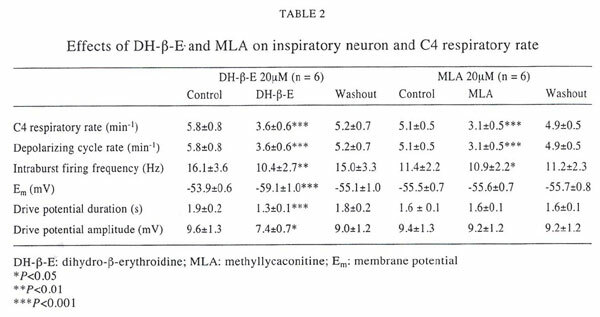 Figure 3: Effects of DH-b-E (A) and MLA (B) on the activity of preinspiratory neurons. 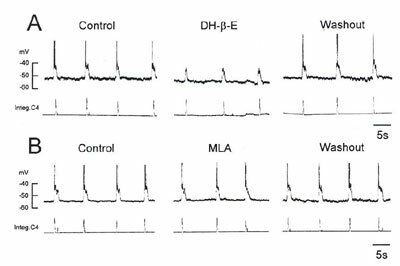 Top traces show the membrane potential of preinspiratory neurons before (Control), during (DH-b-E 20mM or MLA 20mM), and after the application of DH-b-E and MLA. Bottom traces show integrated C4 (Integ.C4) activity (Washout). These past studies indicated that respiratory frequency is modulated by a4b2, but not by a7 nAChR, at least in medullary slice preparations from neonatal rats. This, however, is not consistent with our results in which both a4b2 and a7 nAChR are shown to contribute to central respiratory control. Pre-I neurons are absent in medullary slice preparations, but present in isolated brainstem-spinal cord preparations of neonatal rats, a difference that prompted us to study the effects of DH-b-E and MLA on Pre-I neurons and Insp neurons. Pre-I neurons play a crucial role in the generation of respiratory rhythm (Onimaru et al., 1988; Onimaru et al., 1989; Onimaru et al., 1997; Onimaru and Homma, 2003) and the determination of motoneuron burst timing (Mellen et al., 2003; Sakuraba et al., 2003) in brainstem-spinal cord preparations of neonatal rats. However, the role of nAChRs in respiratory neurons has been investigated only in medullary slice preparation of neonatal rats, in which the Pre-I neurons are absent. In these slice preparations, a low concentration of nicotine induces a tonic inward current and increases in the frequency and amplitude of spontaneous excitatory postsynaptic current in preBötzinger Complex Insp neurons (Shao and Feldman, 2002). These nicotine-induced effects on preBötzinger Complex Insp neurons can be reversed by DH-b-E and are unaffected by MLA or a-BgTx (Shao and Feldman, 2002). The authors of that study concluded that a4b2 nAChRs modulate respiratory pattern via preBötzinger Complex Insp neurons. This is certainly consistent with our findings that DH-b-E has an inhibitory effect on Insp neurons, i.e. hyperpolarization of Em, and causes reductions in intraburst firing frequency, drive potential duration, and drive potential amplitude. However, we also found that DH-b-E induces hyperpolarization of Em and a reduction in intraburst firing frequency in Pre-I neurons. These findings strongly suggest that a4b2 nAChRs are located in both Insp and Pre-I neurons, where they serve to modulate central respiratory activities. We have further shown that MLA also induces hyperpolarization of Em and reductions in intraburst firing frequency in Pre-I neurons. And although it decreases intraburst firing frequency in Insp neurons, MLA does not affect their Em, drive potential duration or drive potential amplitude. It has been shown that Insp neurons receive excitatory synaptic connections from Pre-I neurons (Onimaru et al., 1992, 1996, 1997; Ballanyi et al., 1999; Takeda et al., 2001). Taking this mechanism into account, we speculate that MLA mainly exerts its inhibitory effect on Pre-I, but not Insp, neurons, thereby reducing the excitatory drive from Pre-I neurons to Insp neurons and lowering the intraburst firing frequency of Insp neurons as an indirect result. Furthermore, a7 nAChRs are expressed in presynaptic terminal and mediate Ca2+ entry via voltage-sensitive Ca2+ channels, and a7 nAChRs themselves are high permeable of Ca2+ for the release of ACh in the central nervous system (McGehee et al., 1995; Gray et al., 1996; Wonnacott, 1997). In the brainstem-spinal cord preparation, voltage-sensitive Ca2+ channels are related to the initiation and termination of hyperpolarization and depolarization of Pre-I neurons (Onimaru et al., 1996). Therefore, we can speculate that a7 nAChRs in Pre-I neurons partly characterize the Pre-I neuron burst and affect the respiratory rhythm. In contrast to our previous study (Sakuraba et al., 2003), neither DH-b-E nor MLA induce a desynchronization of C4 respiratory rate and depolarizing cycle rate of Pre-I neurons during drug-induced respiratory depression. However, the NMBA used in the previous study was a muscular nAChR antagonist, not a pure neuronal nAChR antagonist, and we have not analyzed how these drugs might suppress central respiratory activity. It would be interesting to study this question by simultaneous bath application of DH-b-E and MLA in a future study. Further studies also are needed to analyze the different effects of NMBAs and neuronal nAChR antagonists on the desynchronization of C4 respiratory rate and depolarizing cycle rate in Pre-I neurons. Ca2+ entry through neuronal nAChR modulates many biological processors in nervous tissue, and their permeability through a4b2 and a7 nAChRs are different (Fucile et al., 2005). Nevertheless, in our study, the responses of C4 and Pre-I neuron activities induced by the effects of MLA and DH-b-E are not different. Therefore, further studies are needed to analyze the relationship between neuronal nAChR-induced Ca2+ permeability change and respiratory activity. In conclusion, both a4b2 and a7 nAChR subunits are involved in central respiratory control in brainstem-spinal cord preparations from neonatal rats, and a4b2 nAChRs function in both Pre-I and Insp neurons, while a7 nAChRs function solely in Pre-I neurons. This work was supported in part by the Keio Gijuku Postgraduate School Fund for the Advancement of Research (S.S.), the Keio University Grant-in-Aid for Encouragement of Young Medical Scientists (S.S.), the Smoking Research Foundation (S.K. ), and the Grant-in-Aid for Scientific Research from the Japanese Ministry of Education, Science and Culture (J.K. and J.T. ).